Female reproductive function depends on proper development and regulation of hypothalamic–pituitary–gonadal (HPG) axis. The KISS1 gene has been recently recognized as an essential regulator of HPG axis, which is responsible for its timely activation at puberty and in normal cyclical function during adult life., Kisspeptins are a family of closely related peptides encoded by KISS1 gene that act through G-protein-coupled receptor known as GPR54.,, Although KISS1 gene was originally identified in 1996 as a suppressor of metastases of human malignant melanoma, its role in reproduction was identified in 2003 with a better understanding of neuroendocrine regulation of human reproduction from puberty., Kisspeptin binds to GPR54 receptor expressed in gonadotropin-releasing hormone (GnRH) neurons and participates in the control of HPG axis.,,, By binding to its receptor, kisspeptin stimulates the release of GnRH into portal circulation, which in turn stimulates the secretion of luteinizing hormone (LH) and follicle-stimulating hormone (FSH) from gonadotrophe cells of the anterior pituitary. Since kisspeptin is a key central regulator of GnRH secretion, it can be hypothesized that the dysregulated gonadotropin secretion in PCOS is a reflection of altered kisspeptin inputs to GnRH neurons. Any association of kisspeptin with PCOS is an unexplored area of study. Due to complex relationship between kisspeptin and HPG axis, this study was planned to measure the kisspeptin levels in PCOS and to analyze correlations between kisspeptin and PCOS. We aimed to identify any relationship between kisspeptin levels in young Sri Lankan women with well-characterized PCOS, which manifested from adolescence, and compare with ethnically matched adult women without PCOS. The following formula was used in sample size calculation of our ongoing study on association of single-nucleotide polymorphisms (SNPs) with PCOS and the same sample size subjects was used in this study on kisspeptin levels. n = number of subjects in each group. zα= corresponding to α (level of significance (95%)) = 1.96.
zβ= corresponding to β (probability of type II error; power of study is 80%, 1- β = 0.2). p0 = proportion of exposure among control groups (prevalence of polymorphism in general population without PCOS). The estimated proportion of 38% was used in sample size calculation. This study used an OR of 2.7 in its sample size calculation because Sri Lankans with anovulatory PCOS manifest severe symptoms at a younger age, with greater IR and a higher prevalence of metabolic syndrome than white Europeans. Therefore, association of kisspeptin with PCOS is likely to be much higher among Sri Lankan PCOS women. The number of consecutive subjects with confirmed PCOS commencing from adolescence was 50, to which 10% was added to make allowance for noncompliance/drop outs and so on. Therefore, the number of cases was 55. By selecting double the number of controls per case, the final total number of controls was 110. This study was approved by the Ethical Review Committee, Faculty of Medicine, University of Colombo, Sri Lanka. Written informed consent was obtained from all participants. Cases were recruited from the Endocrine Clinic of the University Obstetrics and Gynaecology Department. Diagnosis of PCOS was based on Rotterdam criteria, with diagnostic certification made by a single clinical lead. Inclusion criteria were women whose symptoms manifested from adolescent years (11–19 years WHO), with all three diagnostic criteria present from 16 to 19 years of age. Anovular PCOS or amenorrhea/oligomenorrhea: Anovular cycles are defined when the cycle length is more than 35 days and the lack of demonstrable ovulation by mid cycle and luteal phase ultrasound scans, and mid-luteal serum progesterone. Amenorrhea is the absence of menstrual periods for 6 months or more in a woman who has previously been menstruating. Oligomenorrhea is the menstrual periods occurring at intervals of greater than 35 days, with only four to nine periods in a year. Polycystic ovaries on ultrasound: It is defined by transvaginal or transabdominal ultrasound scan of ovaries, performed within the first 5 days from the onset of menstruation, and finding 12 or more follicles, measuring between 2 and 9 mm and/or an ovarian volume >10 cm3. Hyperandrogenism: Clinical evidence of hirsutism modified Ferriman–Gallwey score (mFG) ≥8, serum testosterone (T) >3.5 nmol/L, and/or free androgen index (FAI) >5. Exclusion criteria included inherited disorders of IR such as Rabson–Mendenhall syndrome, Cushing syndrome, hyperprolactinemia, untreated primary hypothyroidism, congenital adrenal hyperplasia, or an androgen secreting ovarian/adrenal tumor; those taking corticosteroid, antiepileptic, or antipsychotic drugs; history of hormonal contraception within the previous 6 months; pregnancy; and the first postpartum year. Concurrently asymptomatic, normo-androgenic, normal cycling since adolescence, unmedicated, consenting women of reproductive age in whom PCOS was objectively excluded by clinical, biochemical, and ultrasound assessment were recruited as controls. The control subjects were recruited from a single work setting where health promotion programs were conducted from 2012 (3 years before the study). Working women of similar ethnic and social background as the affected subjects were invited to participate in the study. Clinical evaluation was by a questionnaire-based interview regarding sociodemographic factors, detailed menstrual and obstetric histories, infertility if relevant, the onset and degree of clinical symptoms of PCOS, drug history, family history of diabetes, and other cardiovascular risk factors. Detailed physical examination included measurement of standing height to the closest centimeter and weight in kilograms to calculate the body mass index (BMI), waist and hip circumference and waist-to-hip ratio (WHR), resting blood pressure, hirsutism (FG score), frontal balding, distribution of acne, and acanthosis nigricans. Evaluation of the modified FG score was done by a single medically qualified clinical lead of the Department of Obstetrics and Gynecology, Faculty of Medicine, University of Colombo. Ultrasound examinations were performed by a single trained medically qualified ultrasonographer under the supervision of the radiology lead of De Soysa Hospital for Women, Colombo. Biochemical and endocrine evaluation involved determining the kisspeptin and testosterone levels in serum by enzyme-linked immunosorbent assay kit (ELISA kit). Venous blood was collected from each subject and serum was extracted. Serum kisspeptin and testosterone levels were measured with ELISA kits (Phoenix Pharmaceuticals Inc., Belmont, CA, USA and Teco Diagnostics, Anaheim, CA, USA) as per manufactures' recommendation. Analytical sensitivity of kisspeptin assay is 0.08 ng/mL and testosterone assay is 0.06 ng/mL. Samples were tested along with the standards and positive controls. Standards, controls, and samples were assayed in duplicates. Concentration of the samples was determined from standard curve of known concentrations. Routine laboratory tests performed to diagnose/monitor PCOS (follicular phase FSH, LH, thyroid-stimulating hormone, and fasting blood glucose/75 g oral glucose tolerance test) which were carried out at quality-controlled laboratory of the National Hospital Colombo were recorded. Kolmogorov–Smirnov test was used to test the normality of distribution. Values with a biological distribution are presented as mean ± standard deviation. 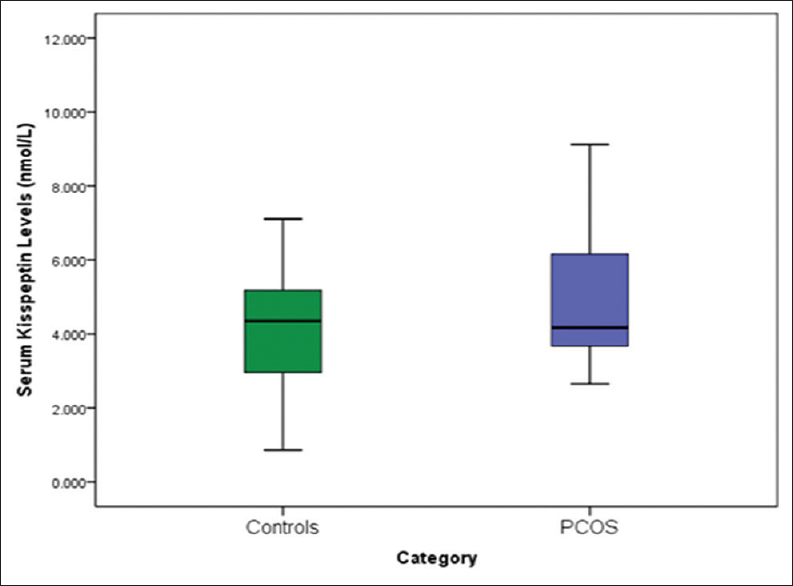 Comparison of means between those with PCOS and controls was performed with independent sample t-test for normal values. Comparisons between the four groups were performed with multivariate general linear model-based one-way analysis of variance. Post hoc analysis was performed with Dunnette's T3 test. Calculation of Spearman's coefficient was used to assess correlation of plasma kisspeptin with each parameter. Determining the best predictors of PCOS was evaluated by multiple logistic regression analysis with backward LR procedure. All analyses were performed by SPSS software (v. 18.0 SPSS, Inc., Chicago, IL, USA). The level of significance was set as 5%. 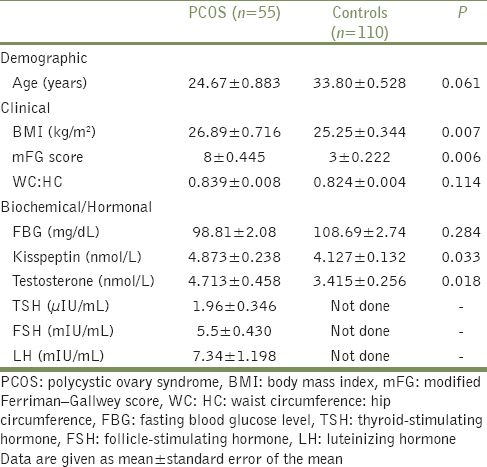 Demographic, clinical, and hormonal characteristics of women with PCOS and controls are summarized in [Table 1]. No significant difference in age, fasting blood glucose level, and WHR was observed. Women with PCOS had significantly higher BMI and mFG score. Serum kisspeptin and testosterone concentrations were significantly higher [Table 1], [Figure 1] and [Figure 2] in women with PCOS (kisspeptin 4.873 nmol/L ± 1.76; testosterone 4.713 nmol/L ± 3.39) than controls (kisspeptin 4.127 nmol/L ± 1.38; testosterone 3.415 nmol/L ± 2.68; P < 0.05). When subjects were further subdivided based on BMI (BMI < 25 kg/m2 and BMI ≥ 25 kg/m2) in both groups, kisspeptin levels continued to be higher in those with PCOS subgroups regardless of BMI [Table 2], [Figure 3]. When obese and overweight women (BMI ≥ 25 kg/m2) and lean (BMI < 25kg/m2) women were analyzed within their own group, PCOS group showed higher kisspeptin levels than controls (4.795 versus 4.263 nmol/L and 5.000 versus 3.995 nmol/L, respectively). Although kisspeptin levels were significantly higher in PCOS group than controls (P < 0.05), there was no significant difference between the subgroups – obese and overweight PCOSversusobese and overweight controls and lean PCOSversus lean controls (post hoc P > 0.05). Similar results were observed with serum testosterone concentration. Serum testosterone was higher in women with PCOS regardless of BMI. 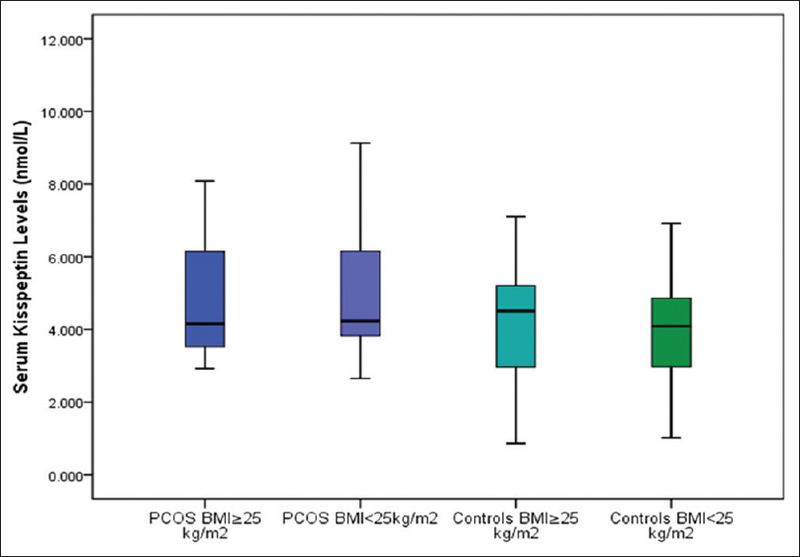 However, when obese and overweight women were analyzed within their own groups, testosterone levels were significantly higher in PCOS group than controls (P = 0.002) [Table 2]. The best predictors of PCOS were evaluated by multiple logistic regression model and were statistically significant with a Hosmer and Lemeshow test value of 0.79 (P > 0.1 was taken as significant). The model also explained 71% (Nagelkerke R2) of the variance among those with PCOS and correctly classified 92% of the cases, which confirms a good fit. In addition, we found that kisspeptin levels [OR: 1.853; 95% confidence interval (CI): 1.246–2.755; P= 0.002] and mFG scores (OR: 2.158; 95% CI: 1.719–2.708; P= 0.0001) alone were positively associated with PCOS in our studied population [Table 3]. Thus, our results suggest that kisspeptin might be an independent marker for PCOS. The pathogenesis of PCOS remains unclear with multiple factors that determine its expression. A single cause for PCOS is unlikely. Several studies have been carried out to determine the role of kisspeptin in PCOS. Chen et al. Jeon et al., and Yilmaz et al. have reported significantly higher kisspeptin levels in women with PCOS when compared with control subjects that are similar to our current findings. Furthermore, Yilmaz et al. showed that women with PCOS exhibit higher kisspeptin levels than controls, even after controlling for BMI. Our study also demonstrates that kisspeptin levels were significantly higher in PCOS group than ethnically matched controls, with no significant difference observed based on BMI. Although it can be argued that the relatively small sample sizes within each subgroup may explain the lack of any relationship of kisspeptin with BMI, it is noteworthy that the overall kisspeptin levels showed a positive correlation with BMI, serum testosterone, and mFG scores that did not reach significance. In addition, in this study, cases and control samples were not strictly age-matched where the mean age of controls was higher than PCOS subjects, although this did not reach statistical significance. This may have led to the lack of an overt relationship between kisspeptin and BMI. One reason for us selecting an older cohort of volunteer women to recruit controls was to ensure that they had regular cycles since adolescence, had achieved their fertility, and thereby deemed to clearly not have any form of even the milder phenotype of PCOS. Nevertheless, Panidis et al. indicated that obese and overweight women with PCOS had significantly lower kisspeptin levels when compared with normal weight women with the syndrome, and that kisspeptin was negatively associated with Free androgen index (FAI). In their study, normal weight women with PCOS and obese controls showed less Insulin resistance (IR) and higher kisspeptin levels when compared with obese women with PCOS. Their contradictory findings may be due to the number of control women being relatively small, and the kisspeptin levels were significantly and inversely correlated with IR. Women with PCOS and BMI >25 kg/m2 being more insulin-resistant with no lean healthy women being included in the control group might have led to an overall increase in IR with a resulting decrease in kisspeptin levels. Therefore, Panidis et al. concluded that the increase in free androgen levels, as a result of IR, is associated with a relatively lower circulating kisspeptin levels. Furthermore, a prospective study by Ozay et al. carried out in a larger group did not find any difference between kisspeptin levels of PCOS group and controls. 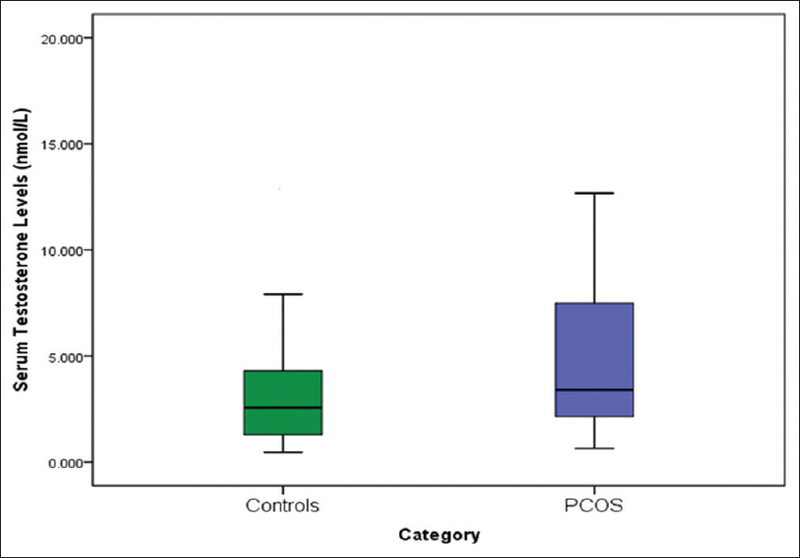 The distribution of phenotypes of PCOS and their relationship with metabolic syndrome among Sri Lankan women have been determined in previous studies. But the association of kisspeptin levels with PCOS has not been studied in Sri Lankan women. To the best of our knowledge, this study is the first to determine any association between kisspeptin levels and well-characterized PCOS manifesting from adolescence in South Asian women. Interestingly, the results of the studies by Yilmaz et al. (Turkish population), Chen et al. (Chinese population), and Jeon et al. (Korean population) were similar to our results. However, Panidis et al. who studied European Caucasian women (Greece) reported contradictory results. Since Asian studies reported similar results to those of our study when compared with European study, it might suggest that the ethnic origin of woman may also have an effect on the expression of kisspeptin. In addition, variation in study design, sample size, demographic, and genetic characteristics of differing study populations may also lead to discrepancies in study results. Moreover, the heterogeneous nature of genetic etiology of PCOS might also play a role in any variation in serum kisspeptin levels. PCOS is a complex endocrine disorder that results from the interaction of susceptible and protective genomic variants in several genes under the influence of environmental factors. Any variation in interlinking genetic factors might affect the expression of KISS1 gene, which in turn may result in alteration of serum kisspeptin levels. Such a phenomenon may thereby play a putative role in the pathogenesis of PCOS along with polymorphisms in other genes involved in its metabolic and reproductive pathways. The mechanism of kisspeptin for regulating gonadotropin remains unknown. Although the clinical and the biochemical features of PCOS have been extensively studied, the molecular basis and polymorphism of KISS1 and GPR54 genes in relation to PCOS are not well elucidated and need further study. In conclusion, this study indicates that Sri Lankan women with well-characterized PCOS manifesting from adolescence exhibit significantly higher kisspeptin levels than ethnically matched controls. Furthermore, our findings confirm that kisspeptin levels are positively associated with PCOS in our studied population. The clinical relevance of this study is foreseen along the lines of biochemical profiling of the well-characterized PCOS phenotype through kisspeptin pathway linked to puberty and adolescence. We propose that increased kisspeptin levels can be used as an early marker of PCOS to help recognize the condition from post-puberty. We recommend confirmation from further large-scaled studies. The authors thank all the staff of the Obstetrics and Gynaecology Department and Unit of De Soysa Hospital for Women, Colombo, for their assistance and support with ultrasound scanning; all staff of the Reproductive Biology and Endocrinology Laboratory, at the Department of Obstetrics and Gynecology, Faculty of Medicine, and the patients and their families for their cooperation. They also thank the staff of Bank of Ceylon, Head Office, Colombo, for their voluntary participation in the study. They specially thank Dr. Anoma Senanayake for her support during ultrasound examinations; and Dr. Sumudu Jayasinghe and Dr. Dakshila Galappathi for their support in coordinating patient evaluation and sample collections. This study was funded by National Research Council of Sri Lanka (NRC grant no. 15-149). Balen AH, Conway GS, Kaltsas G, Techatrasak K, Manning PJ, West C, et al. Polycystic ovary syndrome: The spectrum of the disorder in 1741 patients. Hum Reprod 1995;10:2107-11. Zawadski JK, Dunaif A. Diagnostic criteria for polycystic ovary syndrome: Towards a rational approach. In: Dunaif A, Givens JR, Haseltine FP, Merriam GR, editors. Polycystic Ovary Syndrome. Boston: Blackwell Scientific Publications; 1992. p. 377-84. Alexander CJ, Tangchitnob E, Lepor NE. Polycystic ovary syndrome: A major unrecognized cardiovascular risk factor in women. Rev Cardiovasc Med 2009;10:83-90. Apridonidze T, Essah PA, Iurno MJ, Nestler JE. Prevalence and characteristics of the metabolic syndrome in women with polycystic ovary syndrome. J Clin Endocrinol Metab 2005;90:1929-35. Barber TM, Bennett AJ, Groves CJ, Sovio U, Ruokonen A, Martikainen H, et al. Association of variants in the fat mass and obesity associated (FTO) gene with polycystic ovary syndrome. Diabetologia 2008;51:1153-8. Wijeyaratne CN, Udayangani SAD, Balen AH. Ethnic-specific polycystic ovary syndrome: Epidemiology, significance and implications. Expert Rev Endocrinol Metab 2013;8:71-9. Kumarapeli V, Seneviratne Rde A, Wijeyaratne CN, Yapa RM, Dodampahala SH. A simple screening approach for assessing community prevalence and phenotype of polycystic ovary syndrome in a semi-urban population in Sri Lanka. Am J Epidemiol 2008;168:321-8. Kandarakis ED, Piperi C, Argyrakopoulou G, Spina J, Papanastasiou L, Bergiele A, et al. Polycystic ovary syndrome: The influence of environmental and genetic factors. Hormones Rev 2006;5:17-34. Kandarakis ED, Christakou C, Kandarakis H, Alexandraki KI. Early onset adiposity: A pathway to polycystic ovary syndrome in adolescents? Hormones 2007;6:210-7. Kandarakis ED, Christakou C, Palioura E, Kandaraki E, Livadas S. Does polycystic ovary syndrome start in childhood? Pediatr Endocrinol Rev 2008;5:904-11. Oakley AE, Clifton DK, Steiner RA. Kisspeptin signaling in the brain. Endocr Rev 2009;30:713-43. Roa J, Aguilar E, Dieguez C, Pinilla L, Tena-Sempere M. New frontiers in kisspeptin/GPR54 physiology as fundamental gatekeepers of reproductive function. Front Neuroendocrinol 2008;29:48-69. Pinilla L, Aguilar E, Dieguez C, Millar RP, Tena-Sempere M. Kisspeptins and reproduction: Physiological roles and regulatory mechanisms. Physiol Rev 2012;92:1235-316. Lee JH, Miele ME, Hicks DJ, Phillips KK, Trent JM, Weissman BE, et al. KiSS-1, a novel human malignant melanoma metastasis-suppressor gene. J Natl Cancer Inst 1996;23:1731-7. Roux deN, Genin E, Carel JC, Matsuda F, Chaussain JL, Milgrom E. Hypogonadotropic hypogonadism due to loss of function of the KiSS1-derived peptide receptor GPR54. Proc Natl Acad Sci 2003;100:10972-6. Seminara SB, Messager S, Chatzidaki EE, Thresher RR, Acierno JS Jr, Shagoury JK, et al. The GPR54 gene as a regulator of puberty. N Engl J Med 2003;349:1614-27. Tassignyded AX, Colledge WH. The role of kisspeptin signaling in reproduction. Physiology 2010;25:207-17. Popa SM, Clifton DK, Steiner RA. The role of Kisspeptins and GPR54 in the neuroendocrine regulation of reproduction. Annu Rev Physiol 2008;70:213-38. Clarke IJ, Cummins JT. GnRH pulse frequency determines LH pulse amplitude by altering the amount of releasable LH in the pituitary glands of ewes. J Reprod Fertil 1985;2:425-31. Schlesselman J. Case-control studies: Design, conduct, analysis. New York: Oxford University Press; 1982. p. 354. Frayling TM, Timpson NJ, Weedon MN, Zeggini E, Freathy RM, Lindgren CM, et al. A common variant in the FTO gene is associated with body mass index and predisposes to childhood and adult obesity. Science 2007;316:884-9. Valkenburg O, Uitterlinden AG, Piersma D, Hofman A, Themmen AP, de Jong FH, et al. Genetic polymorphisms of GnRH and gonadotrophic hormone receptors affect the phenotype of polycystic ovary syndrome. Hum Reprod 2009;24:2014-22. Chen ZJ, Zhao H, He L, Shi Y, Qin Y, Shi Y, et al. Genome-wide association study identifies susceptibility loci for polycystic ovary syndrome on chromosome 2p16.3, 2p21 and 9q33.3. Nature genetics 2011;43:55-9. Shi Y, Zhao H, Shi Y, Cao Y, Yang D, Li Z, et al. Genome-wide association study identifies eight new risk loci for polycystic ovary syndrome. Nature genetics 2012;44:1020-5. Boteju WMM, Karunarathna GDKN, Udayangani SAD, Silva KGH, Wijeyaratne CN. Markers of hyperandrogenism in South Asians with polycystic ovary syndrome. Sri Lanka J Diabetes, Endocrinol Metabol 2014;4:3-8. Stewart A, Marfell-Jones M. International Society for the Advancement of Kinanthropometry. New Zealand: Lower Hutt; 2011. AAMI Standards Philosophy and Strategy – Key Elements – Standards – Association for the Advancement of Medical Instrumentation. Available from: http://www.aami.org. [Last accessed on 2016 Dec 01]. Wijeyaratne CN, Seneviratne RdeA, Dahanayake S, Kumarapeli V, Palipane E, Kuruppu N, et al. Phenotype and metabolic profile of South Asian women with polycystic ovary syndrome (PCOS): Results of a large database from a specialist Endocrine Clinic Hum Reprod 2011;26:202-13. Jakubowski L. Genetic aspects of polycystic ovary syndrome. Endokrynologia Polska 2005;56:285-93. Chen X, Mo Y, Li L, Chen Y, Li Y, Yang D. Increased plasma metastin levels in adolescent women with polycystic ovary syndrome. Eur J Obstet Gynecol Reprod Biol 2010;149:72-6. Jeon YE, Lee KE, Jung JA, Yim SY, Kim HY, Seo SK, et al. Kisspeptin, leptin and retinol binding protein 4 in women with polycystic ovary syndrome. Gynecol Obstet Invest 2013;75:268-74. Yilmaz SA, Kerimoglu OS, Pekin AT, Incesu F, Dogan NU, Celik C, et al. Metastin levels in relation with hormonal and metabolic profile in patients with polycystic ovary syndrome. Eur J Obstet Gynecol Reprod Biol 2014;180:56-60. Panidis D, Rousso D, Koliakos G, Kourtis A, Katsikis I, Farmakiotis D, et al. Plasma metastin levels are negatively correlated with insulin resistance and free androgens in women with polycystic ovary syndrome. Fertil Steril 2006;85:1778-83. Ozay OE, Ozay AC, Acar B, Cagliyan E, Seçil M, Küme T. Role of kisspeptin in polycystic ovary syndrome (PCOS). Gynecol Endocrinol 2016;32:718-22.